Plants offer a decorative element to any room in addition to being the best air purifiers. The Amish Hardwood Three Tier Plant Stand offers three solid wood shelves to display plants on with a lower shelf that can be used for display. Bring your favorite plant life to your living room collection or brighten the kitchen with this plant stand. For Feng Shui fans, plants are welcomed in the Feng Shui picture as they are viewed as symbols that support good health. Choose from oak, cherry, brown maple or quarter sawn white oak wood for this Amish made plant stand. 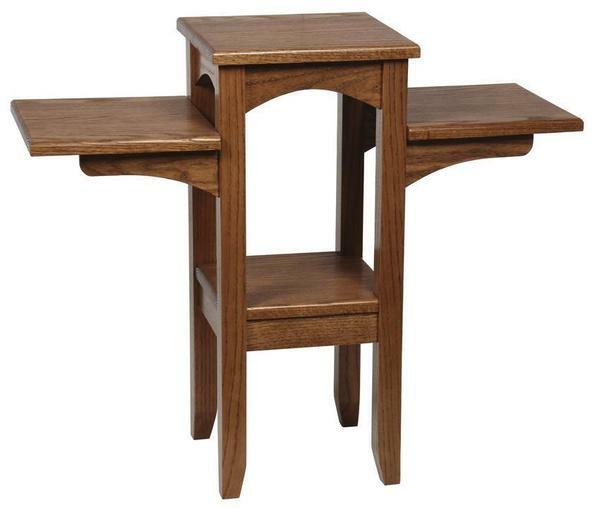 Handcrafted for your home by skilled Amish woodworkers, this plant stand will last for years. Browse our collection of Plant Stands to see the different styles we offer. Keep your indoor air clean with this lovely three tier plant stand to hold your precious plants. Call us today with any questions, toll-free at 866-272-6773. 32" x 12" x 27"